Clay rattles down on the coffin. Grief embraces, with its grip of pain. The dull familiar drumming is the sound of a nation's shame. So ended the poem written by Sean Branigan for a 1991 protest rally against the barbarous torture and murder of Tom Oliver, a farmer on Co Louth's Cooley peninsula. A father of seven, Oliver was a "simple, easy-going, unremarkable man". When in 1989 he found a barrel on his land, he reported it to local gardai, who uncovered its stash of IRA guns and interrogated and released a couple of usual suspects. We don't know who told the IRA Oliver had helped police on both sides of the Border find other arms caches. A self-protecting informant, maybe? He was kidnapped, hauled over the Border to Co Armagh's Bandit Country, beaten unmercifully and shot dead. In their anxiety to extract information out of someone who had none, according to the local priest, his corpse looked as if concrete blocks had been dropped on every bone in his body. The Sinn Fein propaganda machine swung into action to demonise the victim. "The IRA has a duty to protect its organisation, its volunteers and the back-up provided by its supporters," An Phoblacht/Republican News explained under the headline 'IRA Executes Informer". "Tom Oliver's death was due to his willingness to act as an agent for the Dublin Government's Special Branch." Think about that. Oliver wasn't an informer, but just supposing he had been, surely he would have been a patriotic servant of the State? What Sinn Fein was actually saying was what it believed and many of its leaders still believe: that the unelected IRA was the legitimate government of the Irish State and its murder squads the legitimate police force. The IRA fed our sick national psychosis by circulating a lie about having tapes of Oliver talking on a public phone to a Special Branch detective. They were trying to intimidate any local who might be minded to help the police and, by and large, as so often, they succeeded, and the IRA gangs roamed free. Asked by Miriam O'Callaghan in 2015 about the Tom Oliver atrocity, Gerry Adams said blandly apropos her question about his torture: "Of course that's to be condemned if that's the case." He then told her that he had been in the Cooleys at the time Oliver was killed. Told that it was strongly believed by security forces among others that "you were the Court of Appeal" that said that Oliver "should go to his death", Adams went into the familiar denial/sneering/threatening and whataboutery mode he takes refuge in every time one of those pesky skeletons emerges to wave a bony finger at him. Miriam O'Callaghan tried bravely, but she couldn't lay a finger on him. As Malachi O'Doherty says in his fine new biography of Mr Adams, "he is a calculating politician, who can play long and can endure opprobrium that would crush others. He is also astonishingly vain". Vanity feeds his self-righteousness. That the gardai are energetically revisiting the Oliver case caused Mr Adams to be asked last week on LMFM radio if he believed Oliver to have been an informer. He wasn't saying, but described the murder as a "politically motivated killing". So that's all right then. Would he like to see the perpetrators brought to justice? 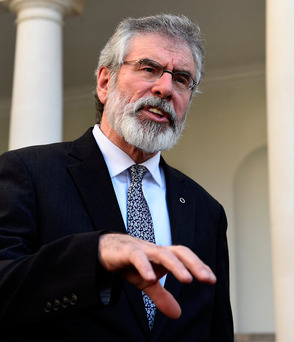 He wasn't going to seek any information about the case, but "I would have a very strong position, while defending the right of the family to prosecutions… I think filling the prisons" with IRA killers "would be totally and absolutely counter-productive". I haven't heard him say that when he's speaking up for families demanding the prosecution of members of the security forces. Sinn Fein used to demand there should be no hierarchy of victims: these days they think defenders of the State should be hounded while terrorists go free. I have long believed that though Mr Adams is crafty, he isn't wise, and his self-regard blinds him to the feelings of normal people. Farming groups are horrified. Joe Healy, of the Irish Farmers' Association, said Oliver's murder "shook farming... to the core". And John Comer, of the Irish Creamery Milk Suppliers Association, thought the vast majority of citizens wanted justice done. Mr Adams's contempt for the natural justice and the rule of law has given vital ammunition to Fianna Fail leader Micheal Martin in his efforts to keep Sinn Fein out of government. Mr Adams, he said, "was primarily an apologist for the IRA", his remarks "actually illustrate a lack of moral compass", and Oliver's murderers "should, of course, be brought to justice". Among colleagues backing him up is Willie O'Dea, who said the comments once more demonstrated that he and his party had "a completely different and unacceptable code of political values". We should remember that most of our politicians are decent democrats. It is bad enough that Louth elects this man, but to have him or his acolytes in government would truly be "a nation's shame".